Hannah Lambie-Mumford took part yesterday in an event organised by the Grantham Centre on ‘Food Waste and Food Poverty’ with Tristram Stuart, author of the book ‘Waste‘ and Tim Allen, director of Sheffield on a Plate. Tristram Stuart first presented the work of his organisation, Feedback, which campaigns to end food waste at every level of the food system. His flagship campaigning event ‘Feeding the 5000’ aims to raise awareness about the scale of food waste by serving a feast to 5000 people made entirely out of food that would otherwise have been wasted. Tristram also spoke about another initiative of his organisation, The Gleaning Network, which aims to recover the thousands of tonnes of fresh fruit and vegetables that are wasted on farms every year across the UK and Europe and redistribute the food to people in need. Hannah then spoke about her research on the rise of food poverty and emergency food provision, focusing on the drivers of these and their relationship to austerity policies, stagnating incomes, rising costs of living and reforms to the welfare state. 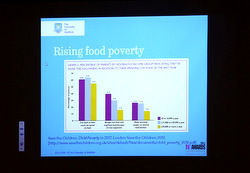 Hannah also talked about the implications of the rise of food charity for the realisation of the right to food in the UK and some of the challenges this phenomenon poses, she went on to highlight practical steps towards enabling everyone in the UK to eat well and actively participate the socially accepted food culture. Time Allen closed the event, speaking about the work of the University of Sheffield’s Student Union towards tackling food waste and helping charitable food schemes. Hannah Lambie-Mumford was a guest on the Toby at Breakfast show on Wednesday. You can listen to her interview about the issues of food poverty and the rise of food bank users here one hour and nine minutes into the programme. Read the storify for the event put together by The Grantham Centre.